Home › News › New Lay-Flat Powder Chemistry, And Improved Film! New Lay-Flat Powder Chemistry, And Improved Film! Our Df96 Monobath and Cs41 2-Bath Color Kit can now ship in First-Class/Priority mail envelopes, not regulated for transport. Save up to 75% on shipping rates! We have some very exciting news for those of you who don't like to pay to ship Earth's most abundant resource around the world! Introducing, CineStill Powder Chemistry! Just add WATER, and you've got a black & white monobath or 2-bath color processing. 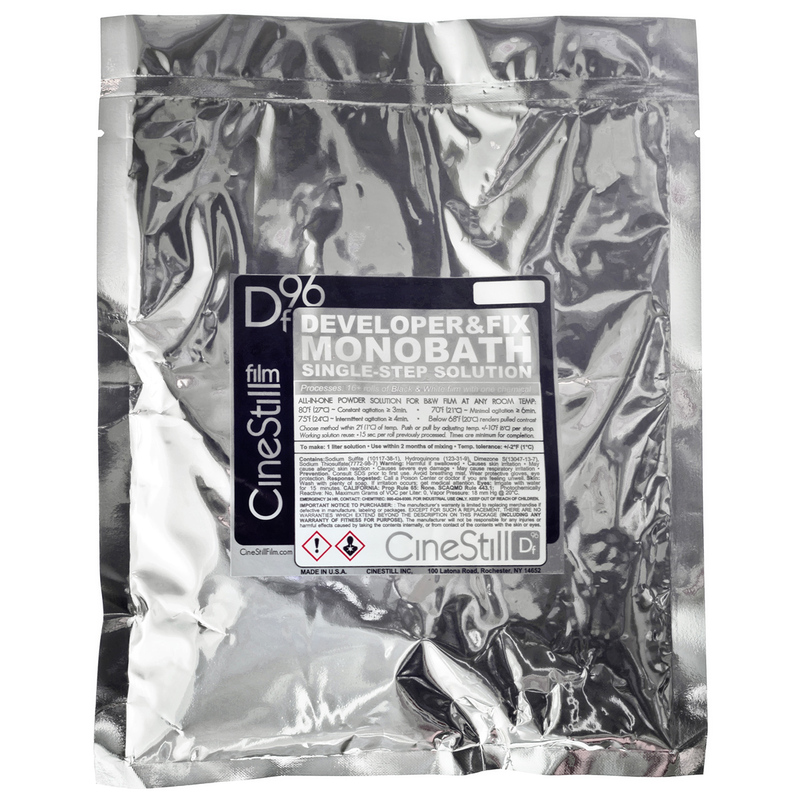 The tried and true Df96 Monobath formula is now available in lightweight powder form, for economical shipping, indefinite shelf-life and home processing simplicity! Still the same motion picture quality solution that guarantees high-resolution, fine grain, a long density scale, and uniform development latitude. Now formulated for mail-order efficiency! 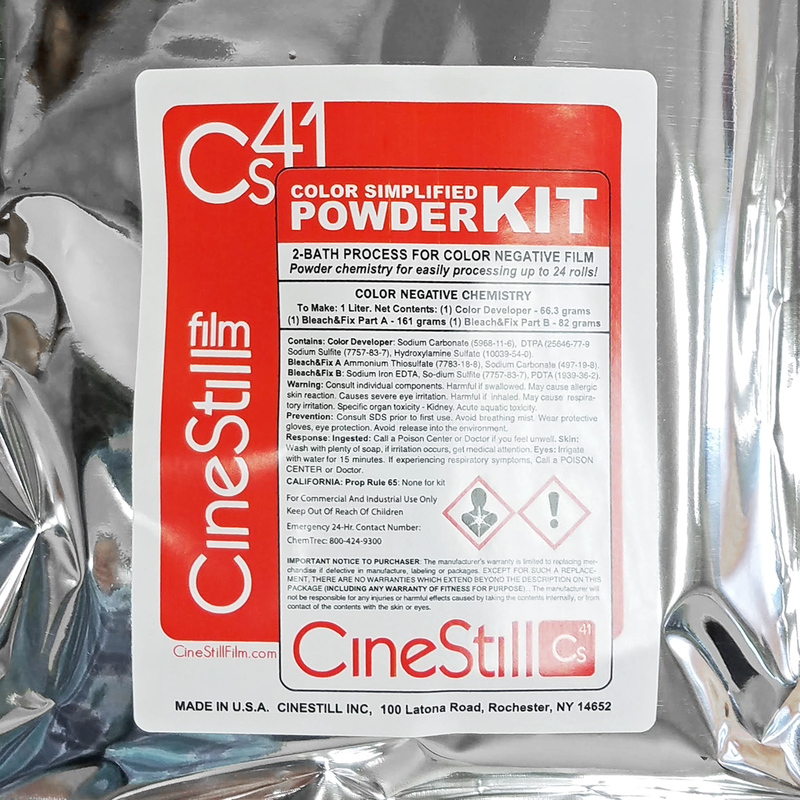 Our new Cs41 Powder Kit is free of transportation restrictions and can be easily shipped internationally! All other color chemistry is classified as "Limited Quantity Hazardous" (ORM-D) and can only be shipped via Ground within the Continental United States due to DOT regulations. This is no longer the case with our Powder formulas! The worries of too much development, dilution, time or agitation are gone. Stop bath? Fixer? Hardener? Gone the way of One-Hour-Photos and formaldehyde. The Single-step solution is now available in powder concentrate or ready-to-use liquid. Processes 16+ rolls in an all-in-one chemical, akin to D96 motion picture developer but with no need for any other chemicals. Perfect for processing CineStill BwXX along with any other black & white film. No special charts, timers or apps needed! Just a processing tank and water. Foolproof self-completing process that guarantees motion picture quality, the smoothest grain structure and crisp tonal curve. Flexible processing in 3-6 minutes at any room temperature (70-80F). Just wash with water and hang to dry. No more complicated measurements or strict margins to deal with. Process all your black and white films in one chemical with absolutely wonderful results! Worlds fastest process at 80°F (27°C) in just 3min! For the beginner and advanced enthusiast alike. Processing your own color film doesn't have to be complicated or expensive! 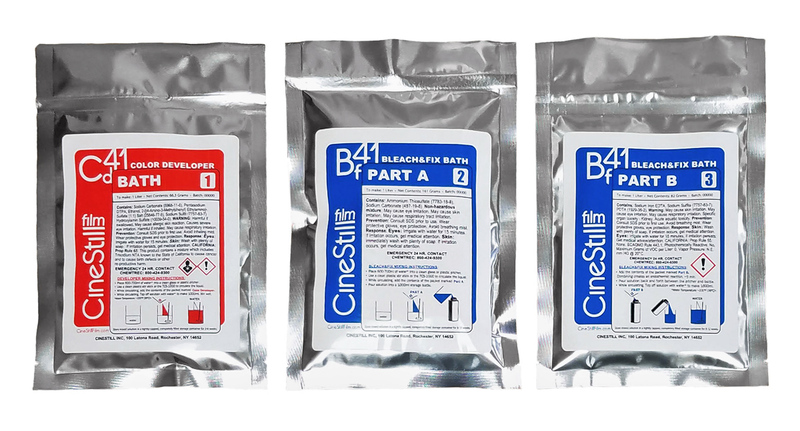 This 3 part powder, 2-bath processing kit can be used at a variety of temperatures with the same equipment you already process your black and white film with at home. No darkroom or automated processor required! If you already process your own black and white film, with this kit, there is no reason not to process C-41 color negative film at home as well! It is specially formulated without compromise for modern color films, not requiring a stabilizer bath. Modern emulsions have built-in "stabilizers" and hardeners that are released through this simplified 2-bath process. You can have beautifully developed, bleached and fixed color negatives, ready to scan or print. All you need is water, a thermometer and any simple tank and reel system! New And Improved CineStill Film! Following the release of medium format CineStill in 2017, we have invested heavily into increasing both the quality and volume of our films, by transitioning our 35mm production to the same manufacturing as our 120 offerings. Our new film is the best quality CineStill yet, featuring an extended shelf life of 2 years, new high quality packaging and edge printing. Since the launch of CineStill film, our material costs have gradually increased each year, while our growth has previously offset our shrinking profit margin. Last year we experienced another signifigant cost increase, in the form of our material size decreasing by 20% while the cost remained the same. We successfully modified all of our equipment and process to handle the smaller scale material, but a price adjustment is necessary to absorb the impact of lower production yields. We aim to maintain a competitive market value and quality among premium film stocks. 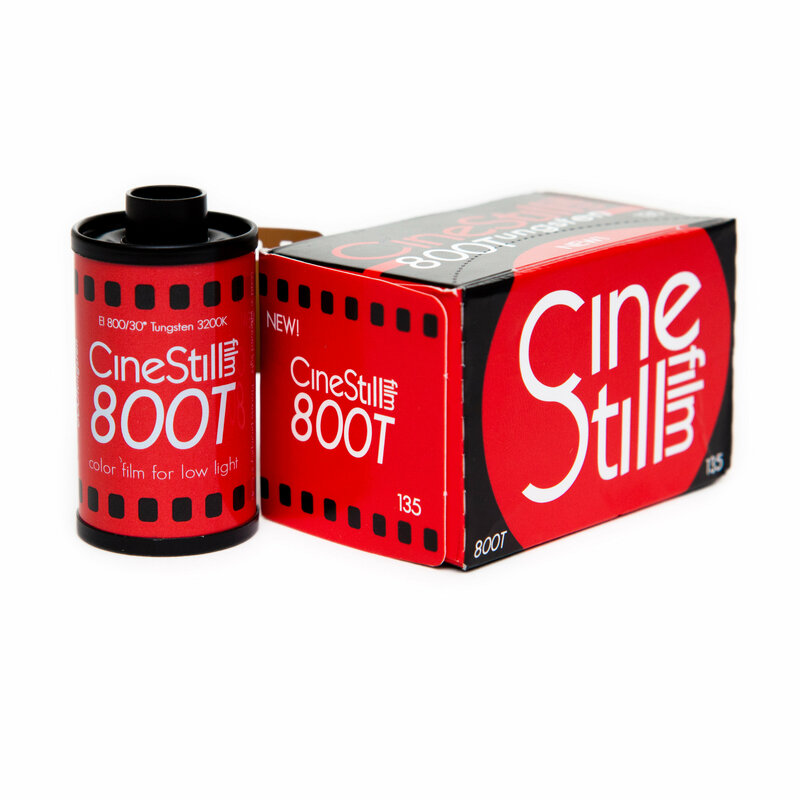 We are adjusting the price of 135 film by 9% to match the 120 film MSRP. We have maintained the price for medium format film to not discourage volume. We need the volume to keep all of our films in production at the highest quality and affordable pricing. As we transition all of our production to the new and improved manufacturing, there will be a 6 month overlap of film with the old and new packaging. Not to worry, all film sold is fresh and will produce the same quality and look. CineStill Film is produced in small batches so it is always fresh. Remember, film is perishable. If you MUST store it, keep it cool. Shoot immediately and processes promptly, we are always making more! Black & White Friday Sale Starts Now! CineStill BWXX is Back in Limited Supply! Medium Format CineStill 50D Pre-Sale in 120!